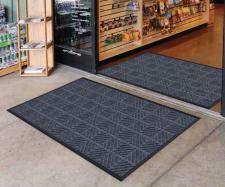 The Montage Ecomat Entrance Matting is one of Commercial Mats and Rubber's best selling earth friendly mats. With its unique surface pattern, massive dirt and water retention, recycled PET surface made from recycled plastic bottles, recycled rubber backing and custom lengths...whats not to love! 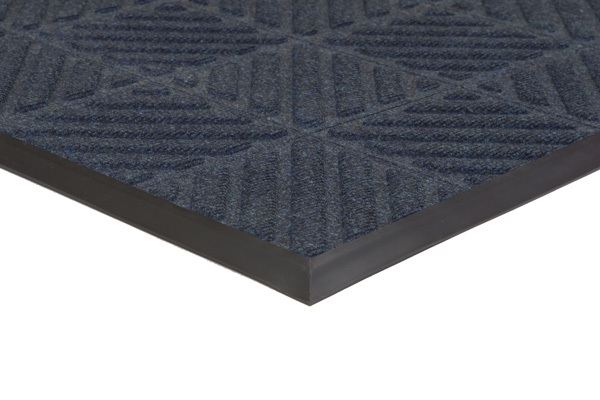 Abrasive scraping surface featuring a specially developed needlepunch carpet with extra coarse fibers and surface coating. Retains dirt, debris, fine particulates and up to 1.5 gallons of water per sq yd. Unique surface coating provides extra safety traction during wet weather. Molded to a rugged recycled rubber base, providing a crush resistant, durable scraping surface. Multi-direction rib pattern and extra deep channels further enhance the scraping action. LockTite specially engineered edging locks the carpet in from both top and bottom. 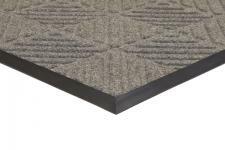 Commercial grade edging made from recycled materials with reinforced corner patches for added strength. Available in many standard and special order sizes. Don't see the size you need? Give us a call or email service@commercialmatsandrubber.com for pricing on custom sizes! Interior and exterior high traffic areas in hotels, hospitals, schools, office buildings, restaurants, etc.